Mouse anti Human CD138 antibody, clone B-A38 (MCA2459GA) used for the detection of syndecan-1 expressing cells in human skin by immunofluorescence. Double immunolabeling and CLSM analysis of developing and adult epidermis for NF1 protein and syndecan-1. (a) At 14 weeks EGA, the NF1 protein (red) shows fibrillar pattern in basal cells while syndecan-1 (green) is localized to the plasma membrane of keratinocytes in all epidermal layers. Close spatial distribution or colocalization (yellow) is detected on some basal cells. (b) In adult epidermis the immunosignals for the NF1 protein (red) and syndecan-1 (green) are completely separate. Scale bars 10 μm in a,b, 2 μm in c,d. 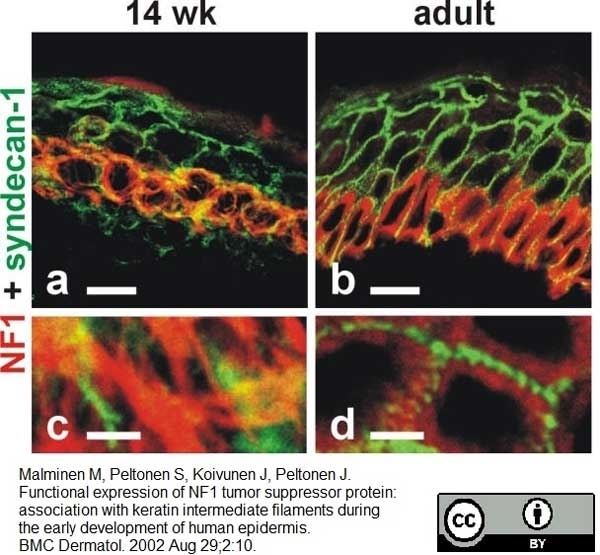 From: Malminen M, Peltonen S, Koivunen J, Peltonen J. Functional expression of NF1 tumor suppressor protein: association with keratin intermediate filaments during the early development of human epidermis. BMC Dermatol. 2002 Aug 29;2:10. AlexaFluor A647 conjugated Mouse anti Human CD138 antibody, clone B-A38 (MCA2459A647) used for the detection of CD138 on bone marrow cells by flow cytometry. B-A38 and DL-101 are both present on bone marrow plasma cells. Four bone marrow samples were used to test the capacity of DL-101 to detect CD138+ cells. (a) The analysis was done on viable cells, using Sytox Blue exclusion, and then on gated cells, which represented less than 0.5% of total cells. (b) Profiles are showed for B-A38 and DL-101 PE-conjugated mAbs for one sample gated on region. The mean frequency ± S.E.M for CD138+ cells was 78.7% ± 1.2% for B-A38 and 59.3% ± 2.1% for DL-101. (c) Frequencies of total are shown for all bone marrow samples according to B-A38 and DL-101; the mean ± S.E.M. was 0.20% ± 0.06% and 0.11% ± 0.05%, respectively. No significant differences were observed between the B-A38 and DL-101 staining in these four bone marrow samples (nonparametric Kruskal-Wallis test). BioMed Research International, vol. 2014, Article ID 536482, 8 pages, 2014. Mouse anti Human CD138 antibody, clone B-A38 (MCA2459GA) used for the detection of syndecan-1 expressing cells in lymphoid follicles by immunofluorescence. Expression of the B cell survival factors BAFF and April in ectopic lymphoid follicles and the presence of plasma cells in ectopic lymphoid follicles. 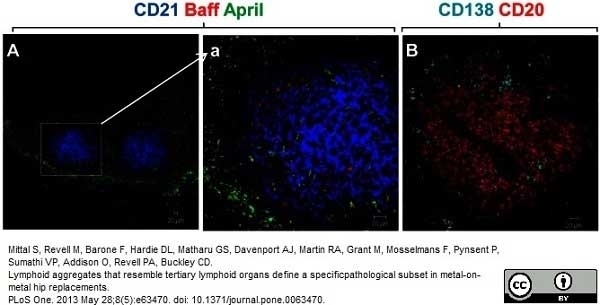 Immunofluorescence images of staining of BAFF (red) and April (green) detected in the CD21+ follicular dendritic cell network (blue) (A) Paraffin sections of tissues showing organised lymphoid aggregates were also stained with a marker for plasma cells, CD138 (cyan), and B cells (CD20) (red) by double immunofluorescence (B). Abundant plasma cells were detected at the periphery of the aggregates as well as in the surrounding tissue. Shown are representative images from the group of cases containing organised lymphoid aggregates. From: Mittal S, Revell M, Barone F, Hardie DL, Matharu GS, et al. (2013) Lymphoid Aggregates That Resemble Tertiary Lymphoid Organs Define a Specific Pathological Subset in Metal-on-Metal Hip Replacements. Mouse anti Human CD138 antibody, clone B-A38 (MCA2459GA) used for the detection of syndecan-1 expressing cells in human colonic tissues by immunohistochemistry on formalin fixed, paraffin embedded tissue sections. Expression of syndecan-1 in normal colonic epithelium and colon adenocarcinomas. a, immunohistochemical staining for syndecan-1 in normal colon. b-c, syndecan-1 staining of colon adenocarcinomas is lost in correlation with tumor differentiation status. d, example of a moderately differentiated adenocarcinoma with strong stromal staining for syndecan-1 and moderate staining of the tumor. e, f, contiguous sections of the same tumor stained for syndecan-1, (e), or fascin, (f), demonstrating strong staining for fascin in the stroma (arrowed). The tumor cells are negative for fascin and syndecan-1. Isolated strongly fascin positive cells correspond to dendritic and vascular endothelial cells and provideinternal positive controls for the fascin staining. From: Hashimoto Y, Skacel M, Adams JC. 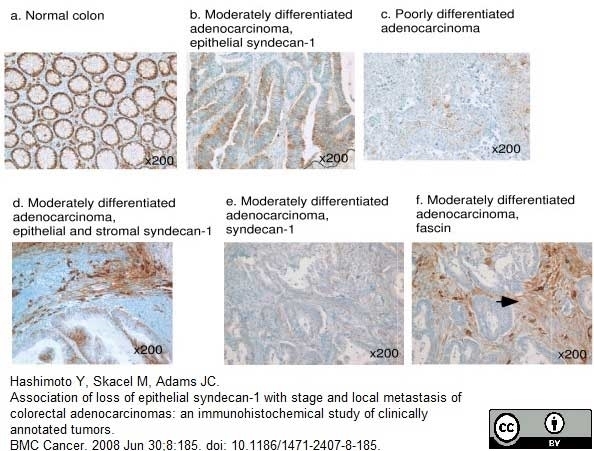 Association of loss of epithelial syndecan-1 with stage and local metastasis of colorectal adenocarcinomas: an immunohistochemical study of clinically annotated tumors. BMC Cancer. 2008 Jun 30;8:185. Mouse anti human CD138 antibody, clone B-A38 (MCA2459GA) used for the identification of plasma cells in human tonsillar cryostat sections by immunofluorescence. Immunofluorescence analysis of 5-LO expression in subsets of tonsillar B lymphocytes. Tonsils were prepared for immunofluorescence analyses and stained with anti-IgD, anti-CD38, anti-CD138 and DAPI. A) B cells within the mantle zone were stained with anti-IgD (green, A1); anti-5-LO (red, A2) and DAPI (blue, A3). The combined picture (A4 (A1+A2+A3)) depicts high expression of 5-LO in IgD+ cells. B) Germinal centre B cells were stained with anti-CD38 (green, B1); anti-5-LO (red, B2) and DAPI (blue, B3). The combined picture (B4 (B1+B2+B3)) shows very weak expression of 5-LO in CD38++ cells. C) Plasma cells within the germinal centre were stained with anti-CD38 (green, C1); anti-5-LO (red, C2) and DAPI (blue, C3). 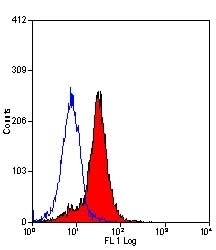 The combined picture (C4 (C1+C2+C3)) demonstrates no expression of 5-LO in CD38+++ cells. D) Plasma cells outside the germinal centre were stained with anti-CD138 (green, D1); anti-5-LO (red, D2) and DAPI (blue, D3). 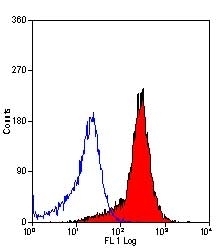 The combined picture (D4 (D1+D2+D3)) depicts no expression of 5-LO in CD138+ cells. The figure represents one out of four examined tonsils. From: Mahshid Y, Lisy MR, Wang X, Spanbroek R, Flygare J, Christensson B, Björkholm M, Sander B, Habenicht AJ, Claesson HE. High expression of 5-lipoxygenase in normal and malignant mantle zone B lymphocytes. BMC Immunol. 2009 Jan 9;10:2. Mouse anti Human CD138, clone B-A38 (MCA2459GA) used for the identification of plasma cells in the bronchial submucosa by immunohistochemistry on acetone fixed, resin embedded tissue sections. 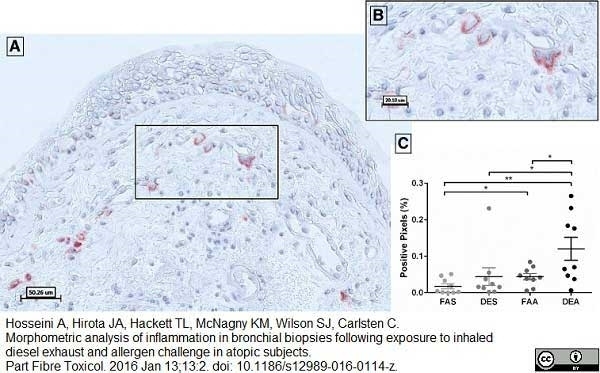 From: Hosseini A, Hirota JA, Hackett TL, McNagny KM, Wilson SJ, Carlsten C.
Morphometric analysis of inflammation in bronchial biopsies following exposure to inhaled diesel exhaust and allergen challenge in atopic subjects. Part Fibre Toxicol. 2016 Jan 13;13:2. Mouse anti Human CD138 antibody, clone B-A38 (MCA2459GA) used for the evaluation of syndecan-1 expression on plasma cells in cardiovascular surgical specimens by immunohistochemistry on formalin fixed paraffin embedded tissue sections. From: Hourai R, Kasashima S, Sohmiya K, Yamauchi Y, Ozawa H, Hirose Y, Ogino Y, Katsumata T, Daimon M, Fujita SI, Hoshiga M, Ishizaka N.
BMC Cardiovasc Disord. 2017 Feb 3;17(1):52. Mouse anti human CD138 antibody, clone B-A38 recognizes human CD138, also known as Syndecan-1 (SDC-1). CD138 is a member of the transmembrane heparan sulfate proteoglycan family (O’Connell et al. 2004, Sanderson et al. 2008). It is composed of a core protein (comprising 3 domains; a short cytoplasmic domain, a transmembrane domain, and a long extracellular domain) and covalently attached heparan sulfate chains (Sanderson et al. 2008). Syndecan-1 is expressed on the surface of plasma cells within the hematopoietic system and on the surface of mature epithelial cells (O’Connell et al. 2004). It acts as an extracellular matrix receptor, involved in many cellular functions, including cell binding, cell signaling and cytoskeletal organization through cell-cell adhesion and cell-matrix adhesion (Sanderson et al. 2008). Purified IgG prepared by ion exchange chromatography. Spleen cells from immunized Balb/c (Iffa Credo) mice were fused with cells of the mouse X63/Ag.8653 myeloma cell line. Prior to reconstitution store at +4oC following reconstitution store at +4oC. 2This product requires heat pre-treatment. Sodium citrate buffer pH6.0 is recommended for this purpose. Borset, M. et al. (1993) Lack of IL-1 secretion from human myeloma cells highly purified by immunomagnetic separation. Br J Haematol. 85 (3): 446-51. Du, S. et al. (2010) Systemic mastocytosis in association with chronic lymphocytic leukemia and plasma cell myeloma. Int J Clin Exp Pathol. 3 (4): 448-57. Kylänpää, L. et al. (2009) Syndecan-1 and tenascin expression in cystic tumors of the pancreas. Beauvais, D.M. et al. (2009) Syndecan-1 regulates alphavbeta3 and alphavbeta5 integrin activation during angiogenesis and is blocked by synstatin, a novel peptide inhibitor. J Exp Med. 206: 691-705. J Cell Sci. 123: 3796-807. Chang, H. et al. (2010) CKS1B nuclear expression is inversely correlated with p27Kip1 expression and is predictive of an adverse survival in patients with multiple myeloma. Mahshid Y et al. (2009) High expression of 5-lipoxygenase in normal and malignant mantle zone B lymphocytes. Guedez, L. et al. (2005) Tissue inhibitor of metalloproteinase 1 (TIMP-1) promotes plasmablastic differentiation of a Burkitt lymphoma cell line: implications in the pathogenesis of plasmacytic/plasmablastic tumors. Li, K. et al. (2010) Anaplastic lymphoma kinase-positive diffuse large B-cell lymphoma presenting as an isolated nasopharyngeal mass: a case report and review of literature. Int J Clin Exp Pathol. 4: 190-6. Yang, Y. et al. (2007) The syndecan-1 heparan sulfate proteoglycan is a viable target for myeloma therapy. Thaunat, O. et al. (2010) Chronic rejection triggers the development of an aggressive intragraft immune response through recapitulation of lymphoid organogenesis. Cannizzo, E. et al. (2012) The role of CD19 and CD27 in the diagnosis of multiple myeloma by flow cytometry: a new statistical model. Am J Clin Pathol. 137 (3): 377-86. Li, K. et al. (2012) A rare and unique case of aggressive IgE-γ plasma cell myeloma in a 28-year-old woman presented initially as an orbital mass. Christianson, H.C. et al. (2013) Cancer cell exosomes depend on cell-surface heparan sulfate proteoglycans for their internalization and functional activity. Proc Natl Acad Sci U S A. 110 (43): 17380-5. Malminen, M. et al. (2002) Functional expression of NF1 tumor suppressor protein: association with keratin intermediate filaments during the early development of human epidermis. Itoua Maïga, R. et al. 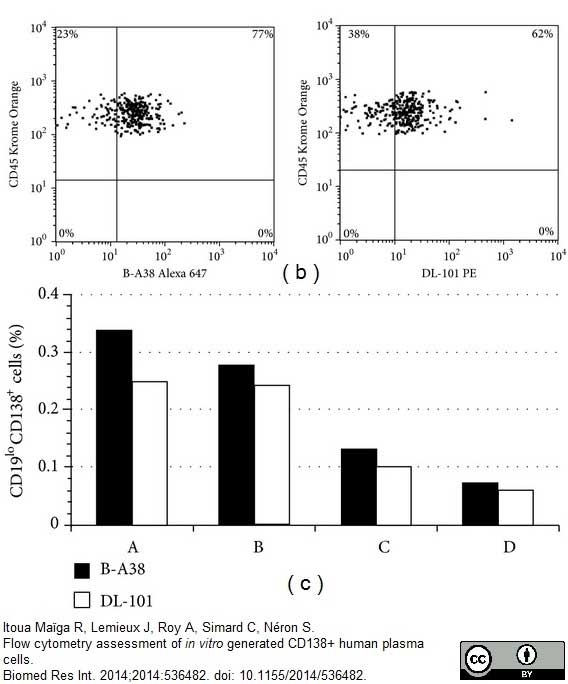 (2014) Flow cytometry assessment of in vitro generated CD138+ human plasma cells. Biomed Res Int. 2014: 536482. Di Niro, R. et al. (2016) Responsive population dynamics and wide seeding into the duodenal lamina propria of transglutaminase-2-specific plasma cells in celiac disease. Mucosal Immunol. 9 (1): 254-64. Yigit, N. et al. (2015) Nuclear factor-erythroid 2, nerve growth factor receptor, and CD34-microvessel density are differentially expressed in primary myelofibrosis, polycythemia vera, and essential thrombocythemia. Hum Pathol. 46 (8): 1217-25. Lum, D. & Wong, K.P. (2006) Sarcomatoid plasmacytoma: a diagnosis not often considered. Gill, J. et al. (2009) A case of hyperIgG4 disease or IgG4-related sclerosing disease presenting as retroperitoneal fibrosis, chronic sclerosing sialadenitis and mediastinal lymphadenopathy. Adepu, S. et al. (2015) Incipient renal transplant dysfunction associates with tubular syndecan-1 expression and shedding. Am J Physiol Renal Physiol. 309 (2): F137-45. Hosseini, A. et al. (2016) Morphometric analysis of inflammation in bronchial biopsies following exposure to inhaled diesel exhaust and allergen challenge in atopic subjects. Part Fibre Toxicol. 13: 2. Uenoyama, A. et al. (2016) Effects of C-xylopyranoside derivative on epithelial regeneration in an in vitro 3D oral mucosa model. Biosci Biotechnol Biochem. 80 (7): 1344-55. Hourai, R. et al. 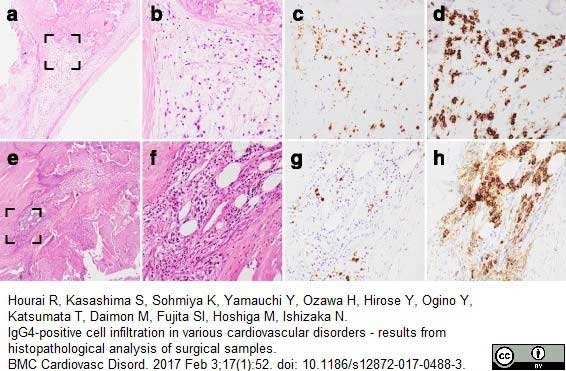 (2017) IgG4-positive cell infiltration in various cardiovascular disorders - results from histopathological analysis of surgical samples. BMC Cardiovasc Disord. 17 (1): 52. Tran, D.N. et al. (2017) Polychromatic flow cytometry is more sensitive than microscopy in detecting small monoclonal plasma cell populations. Cytometry B Clin Cytom. 92 (2): 136-144. Anttonen, A. et al. (1999) Syndecan-1 expression has prognostic significance in head and neck carcinoma. Br J Cancer. 79 (3-4): 558-64. O'Connell, F.P. et al. (2004) CD138 (syndecan-1), a plasma cell marker immunohistochemical profile in hematopoietic and nonhematopoietic neoplasms. Am J Clin Pathol. 121:254-63. Sanderson, R.D. et al. (2008) Syndecan-1: a dynamic regulator of the myeloma microenvironment.